Today I have a review for you from the Born Pretty Store! When Born Pretty contacted me to ask if I would review some products for my blog, I eagerly jumped on the chance. I have purchased several things from Born Pretty and have been pleased with everything I have purchased. I selected the Hello Kitty Floral Stamping Set (http://www.bornprettystore.com/hello-kitty-floral-stamping-nail-nail-stamp-p-991.html) because I don't have any stamping tools! I started with a base of China Glaze Tart-y For The Party from the Avante Garden collection. This was 2 easy coat. Then, I stamped a butterfly on my ring finger. I tried using just one butterfly from the stamp but that didn't transfer as well as I would have liked, so I stamped the entire image on my middle finger and that worked much better. Do you guys like to see this sort of nail art on my blog? Clearly, I need practice! But this stamping set was very easy to use and I was pretty pleased with the results for my first time stamping! I liked the shorter stamper, it felt easier to control than some of the longer stampers I've held. 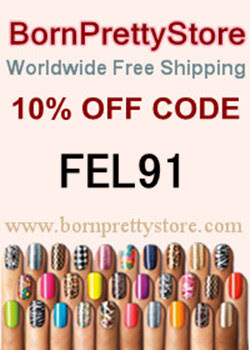 Born Pretty Store was nice enough to include a coupon code for my readers! Use code FEL91 for 10% off your order! If you haven't visited Born Pretty before, I suggest you check it out. They have tons of nail art tools, rhinestones, glequins, polishes, etc. etc., as well as a bunch of other things that are super and girly! March Untrieds: Color Club Halo Hues 2013!